The Ring-necked Duck is continuing its extended stay. A Dunnock on the 26th was the first for the year and two were seen the following day when there were also three Chiffchaff and eight Chaffinch. The 28th produced a male Sparrowhawk while the 29th brought a Black Redstart, three Wheatear and two Chiffchaff. On the 30th two Hawfinch flew out of Holland House gardens. Spring is slowly creeping upon us, the first Chaffinch of the year was seen on the 17th with it or another seen on the 23rd when the first Wheatear was also seen. The 24th produced a Siskin and a Rook. 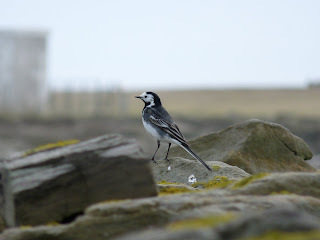 A small arrival happened on the 25th when there were 5 Wheatear, 3 Chiffchaff (the first for the year ), 2 Stonechat , a Black Redstart and a small movment of corvids that consisted of 3 Rook, 6 Hooded Crow, 2 Carrion Crow and a hybrid Hooded x Carrion Crow. 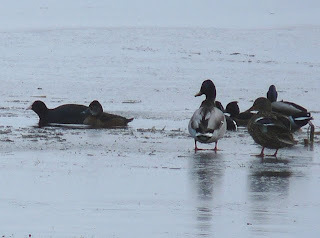 Not a lot of change recently, the Ring-necked Duck is still on Ancum loch and the various geese are still present with the wintering Grey-lags. Two dark-bellied Brents were seen on the 6th when 54 Twite were in the obs crop fields and the first Lesser Black-backed Gull of the spring was seen. 84 Skylark on the 2nd and 23 Snow Bunting on the 5th were the best counts for the period and three Pied Wagtail on the 12th werethe first of the year. Still not a lot of change with wintery weather still prevailing. The Skylark flock increased to 164 on the 24th before decreasing to double figure counts. 17 redwing on the 24th was a reasonable recent count. A Woodcock was seen on the 25th and 61 Purple Sandpipers were at the high tide roost near the pier on the 28th. The Ring-necked Duck was present throughout.